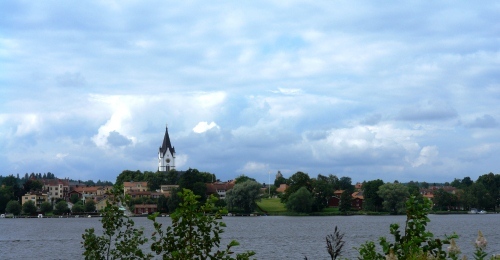 The towns of Nora and Gyttorp are separated by a short stretch of road through the woods, and each look out onto a different lake; stand on the shore in Nora and you are staring West across the Norasjön, from Gyttorp you gaze to the east across the wind-ripples of the Vikern. 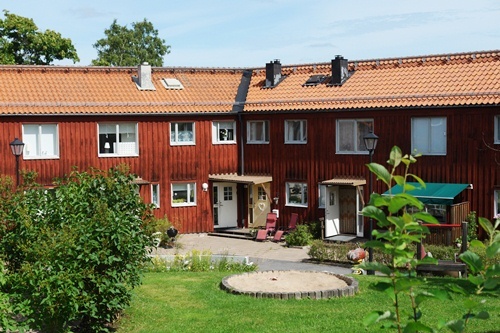 You can easily visit the two in a single morning, walking amongst the picturesque wooden houses of Nora before exploring the functional terraced townhouses of Gyttorp. These two neighbouring towns couldn’t look more different, and it is this contrast that makes them together a fascinating look at how we imagine a town or community should be designed and organised. Nora, despite appearances, is most likely the younger of the two towns, dating back to 17th Century. As we have mentioned on these pages before, Nora was in the heart of the mining industry of the Bergslagen, and its railway station welcomed the very first standard gauge line in Sweden, the tracks used to transport the wood, the minerals and iron that was extracted from the surrounding landscape. 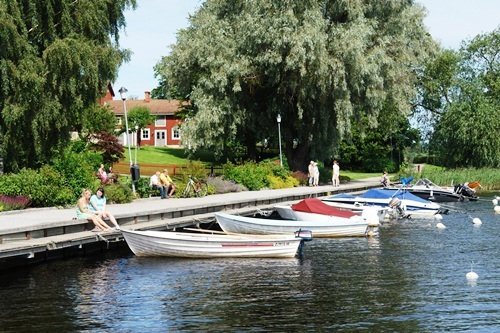 But if Nora has an industrial past, illustrated by the railway station and the old carriages down at the water’s edge, you do not get much of a sense of it as you explore the narrow lanes that run from the square by the church down to the lake. 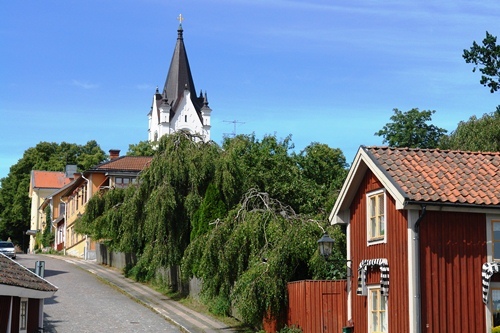 Most of Nora is built out of timber, is both incredibly picturesque and fits perfectly your imagination of how a Swedish town should look, and it has become something of a tourist attraction thanks to its well-preserved collection of wooden houses. 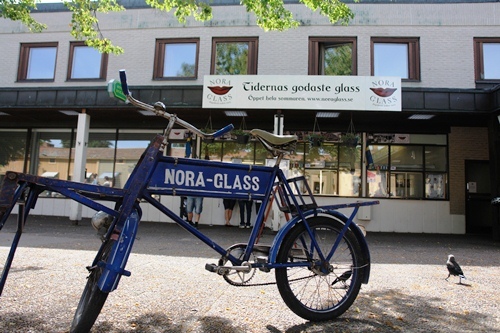 If Nora has an obvious function in the 21st Century, it is as the place where you can get the best ice cream in Sweden – the good folks of Nora Glass make only three flavours a day and still deliver it in cans to the only two outlets in town early each morning – and as a place where the nostalgic come to wander along the cobblestones and imagine themselves in a town of a different time. 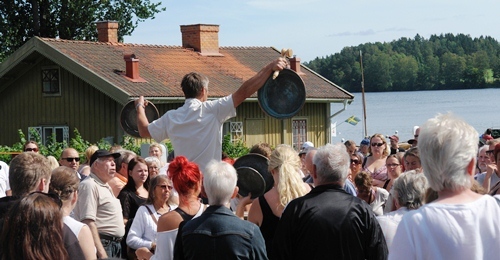 Indeed, on the first day we walked through Nora there was an auction taking place down by the water, a fleamarket-lovers dream of old pots and pans, faded paintings and family heirlooms. And on the church square, one of the most popular shops for visitors is an old antique store, selling packaging from Swedish products of the 1950s, cookbooks of the 1930s, and all kinds of knickknacks and bric-a-brac. This feeling of nostalgia for an idealised and imagined past is furthered by the fact that many locals of the region appear to have a passion for cars and vehicles of the post-war period, and that most of the tourist attractions – beyond the nature trails and watersports – are focused on how the region lived and worked in times past. The townhouses, shops and school of nearby Gyttorp also hark back to a different era, but one where the focus was not the romanticism of the old ways but utopian dreams for how we might live in the future. The town itself dates back to the Middle Ages, and since the mid-ninteenth century was concerned with the production of explosives, whether for the military or the mining industry. In 1915 the local company merged with Alfred Nöbel’s Nitroglycerin AB and the new company moved all its production to Gyttorp, making it by far and away the most important employer in the town. 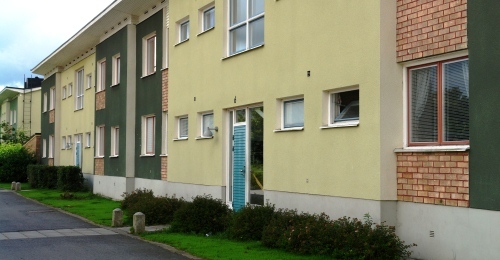 After the Second World War Sweden went through some remarkable changes, including the rise of the social welfare state that had its impact on new housing projects throughout the country, as in many other European nations. 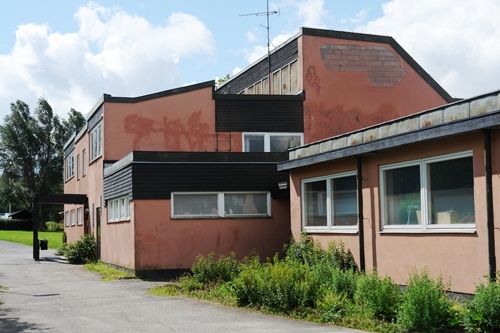 Interestingly, the building of the “new” Gyttorp in the 1950s was done by the Nitroglycerin AB themselves, as they looked to build affordable housing for their workforce. 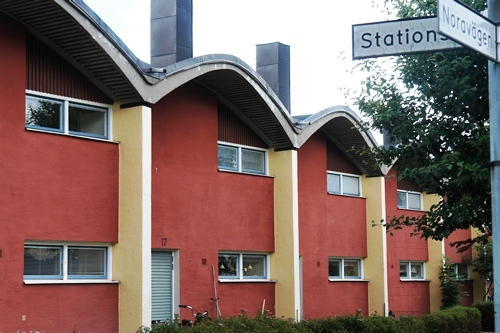 Between 1948 and 1961 over 130 houses and apartments were built, under the guidance of the British architect Ralph Erskine, who had worked on Welwyn Garden City before moving to Sweden where he spent most of his working life. 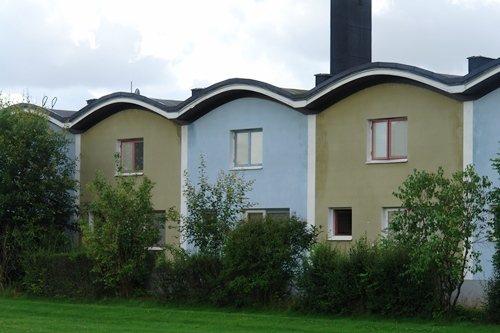 The Gyttorp he built was inspired by the functionalism of many Swedish architects at the time, but also the social-democratic, social-welfare model that appealed to Erskine’s own Humanist beliefs. 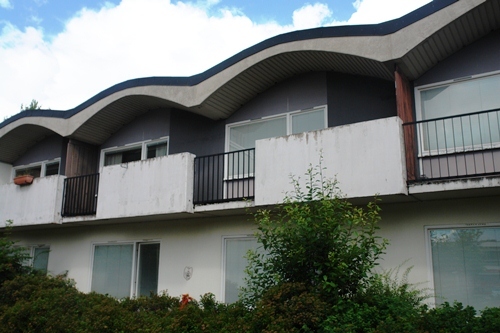 As we walked around the houses, I couldn’t help but be reminded on similar “experiments” in new forms of housing such as Berlin’s Hufeisensiedlung (built in the 1920s), or indeed the new towns of England such as Skelmersdale (1960s), not far from where I grew up. Sadly, Gyttorp feels less like the manifestation of a hopeful utopian future than it does the faded dreams of its architects. Gyttorp has the feel of a town that has arrived on hard times, whether through the condition of the buildings or the people hanging out on its streets. The workforce has fallen to one-fifth of its peak in the 1980s, and as in so many one company towns, there are not many options when the jobs disappear. To walk through Nora and Gyttorp, on the same day, is to get a sense of not only the differing aesthetic tastes of architects and communities in different periods of history, but also what this can mean in the future when communities need to reinvent themselves. 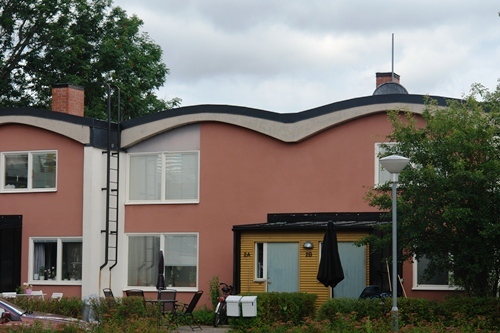 It seems somewhat ironic that it is the “futuristic” Gyttorp that is left looking dated and abandoned, whilst the wooden houses and carefully preserved nostalgia of Nora that gives the latter a much greater sense of optimism as we ease into the second decade of the 21st Century. This entry was posted in Places, Reflections on September 3, 2012 by Paul Scraton.